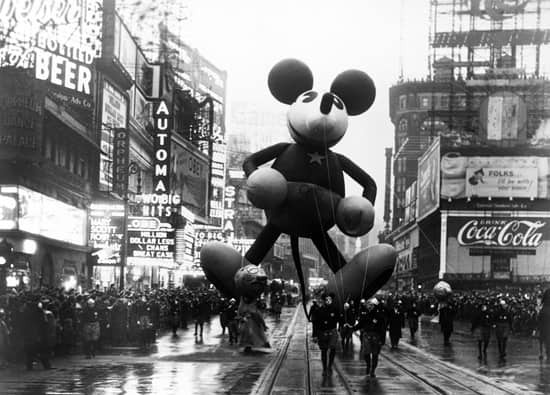 It was New York City, 1934, and Mickey Mouse was about to make his grand debut in the Macy’s Santa Claus Parade (now Macy’s Thanksgiving Day Parade). 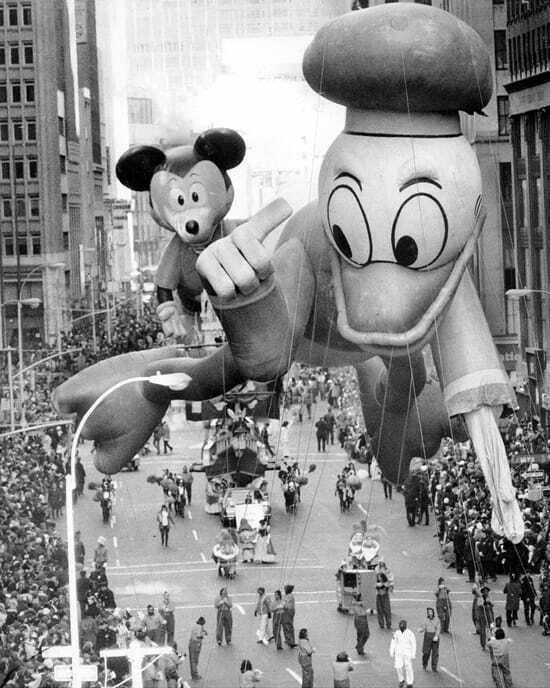 The first Mickey Mouse balloon was a collaborative effort between Walt Disney and Macy’s Tony Sarg, who years earlier applied the principles of marionette puppetry to invent the type of parade balloons we know today. This Mickey was easily one of the biggest that Disney had produced yet, hand-painted and measuring in at 40 feet tall (the star on his chest is a nod to the Macy’s logo). Mickey was led in the parade by a team of 25 handlers who were festively dressed in Mickey/Minnie costumes. A smaller Pluto balloon, a 34-foot-tall Big Bad Wolf, a 31-foot-tall Little Pig, and a 12 ½-foot-tall Horace Horsecollar followed along in the 1934 procession. 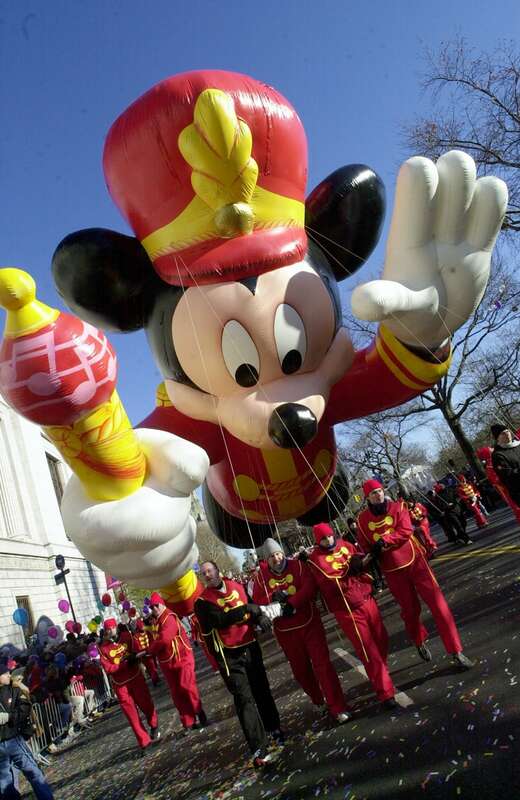 In the years since, Mickey and other Disney characters have marked company milestones – many of them related to our theme parks – by appearing in the parade. Mickey and Donald Duck (who debuted in 1935) appeared together in 1972 to celebrate the first anniversary of Walt Disney World Resort. Mickey returned again in 1973 to mark 50 years of Disney cartoons. In 1984, Donald Duck marked his 50th birthday in the parade, following along right behind the procession’s classic Tom Turkey float. 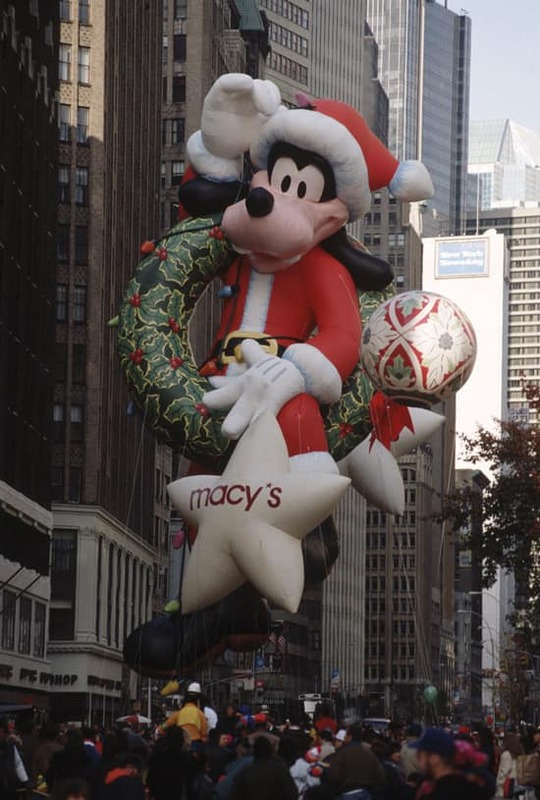 Santa Goofy took the spotlight in 1992, appearing as the “new” balloon in the year’s parade. The procession also featured 6,000 amateur tap dancers donning Mickey Ears, tapping to set the Guinness World Record for Largest Assembly of Tap Dancers. In 2000, a new Bandleader Mickey balloon had the honor of leading the first parade in the new millennium. Most recently, Sailor Mickey debuted in the parade in 2009 and 2010 to mark the announcement of Disney Dream and Disney Fantasy cruise ships. Be sure to look for Sailor Mickey again in this year’s parade, who will celebrate the upcoming debut of the Disney Fantasy ship! This is a great article! 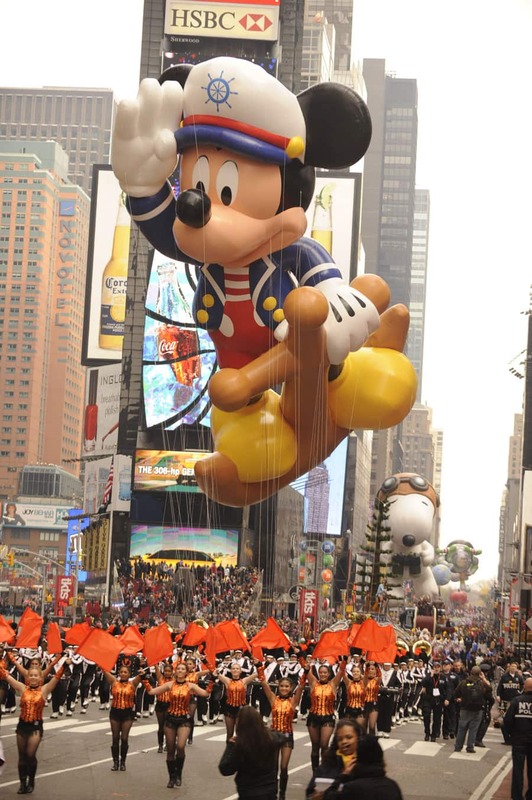 I love the pictures that you posted and seeing the connection between Disney and the Macy’s parade was really interesting. Wow, I love seeing all the balloons though out the years. I love seeing the old black and white photos! So cool! 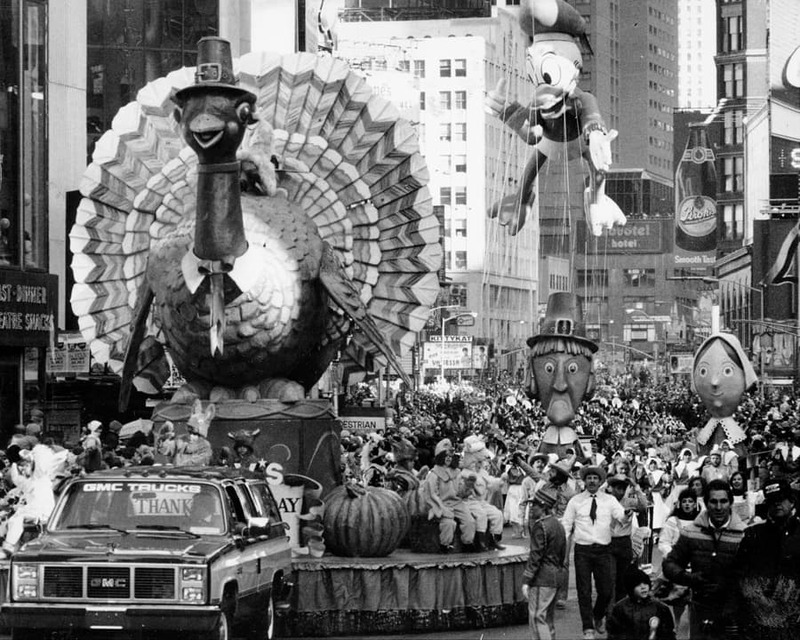 I am watching the Macy’s Thanksgiving Day parade right now. 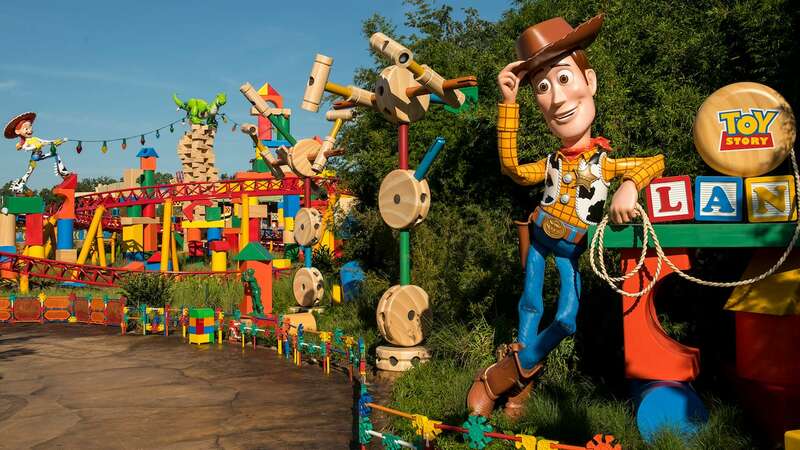 Opened my Disney Parks blog daily e-mail and this article was there! Thank you so much for sharing! Great Pics! Thanks for sharing with us! 🙂 It’s neat to see how mickey (and NY) has changed! And isn’t that Buzz Lightyear I see back there behind Snoopy in the last picture?